Ken and Incineroar complete the initial roster of 74 fighters! During today’s final Super Smash Bros. Ultimate Nintendo Direct the last pair of fighters were finally revealed! Ken from Street Fighter and the Pokémon Incineroar will be joining the roster to take the final count to 74 when the game launches on December 7th, 2018. Ken joins as an echo fighter of his fellow Street Fighter, Ryu. Just like the Super Street Fighter II Turbo character he’s based on, Ken is a little faster than Ryu. His Hadokuen is also shaped slightly differently and players can expect different moves including his two final smashes: Shinryuken and Shin Jinraikyaku. Incineroar joins from Pokémon Sun and Moon but doesn’t play like other Pokémon fighters we’ve seen in Super Smash Bros. Ultimate. 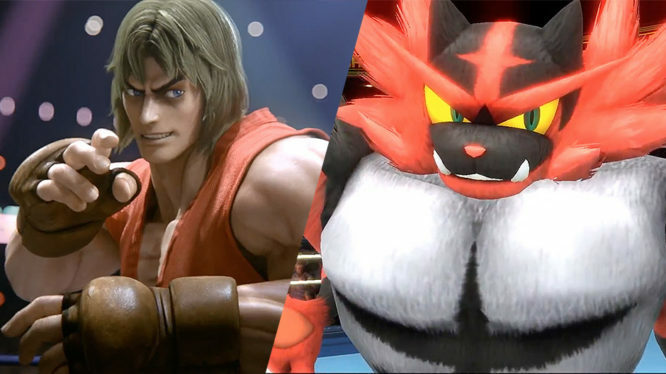 Players can expect to battle with pro-wrestling inspired moves and just like the pros, Incineroar will pose for the audience after a successful move. Don’t worry though, as poses are easily cancelled if you need to quickly get back into battle. Piranha Plant joins the roster as a pre-order bonus. As a bonus, Piranha Plant will be available as a fighter for those who opt to pre-order the game either digitally or physically. 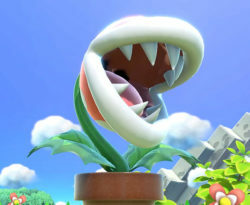 While Piranha Plant won’t be available in the roster at launch, the fighter is expected to be available a month or so later in early 2019. Nintendo also confirmed that paid DLC for Super Smash Bros. Ultimate is planned but development has not yet been started. The DLC is expected to include additional fighters, stages and music. Of course, a lot more information was unveiled about Super Smash Bros. Ultimate during the Direct including the game’s new “Spirits” mode. Eager fans can pre-purchase the game today from the Nintendo eShop and launches on Nintendo Switch on December, 7th 2018.